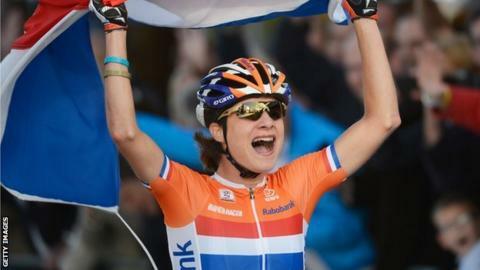 Olympic road race champion Marianne Vos says a women's event at this year's Tour de France gives female racers the "chance to make a dream come true". Vos, 26, will race against elite women in La Course, a 90km race held before the final men's stage of the Tour. With no women's Tour having been held since 2009, Vos was one of a number of athletes who had called for a full women's Tour, and thanked organisers. "We needed a stage and they've given it," she said. "It's a historic day." What began life as the Tour de France Feminin has been staged on and off, in numerous guises, since 1984. But the staging of a women's race in conjunction with the final men's stage in Paris this year will be the first time women have competed alongside their male counterparts on the Tour since 1989. De Vos, who retained her road World Championship title in 2013, will compete against a field of about 100 women with a finish on the Champs-Elysee hours before the men's peloton arrives on 27 July. The winner will receive 22,500 euros (£18,500), the same amount earned by the winner of a men's stage and there will be podium boys giving out the prizes.